The last round you'll ever need G2 Research R.I.P. 9mm * 16" Penetration * Up to 6" diameter spread * 96 gr projectile * 2" grouping at 25 yrds * 1265 FPS / 370 Muzzle Energy * 9 Separate Wound Channels * Precision Machined * Solid Copper / Lead Free * Defeats all known barriers such as sheet metal, sheet rock, windshields, plywood, heavy winter clothing. It started with an un-compromised idea of creating the ultimate personal protection round. The geometry at the tip of the projectile has much to do with the way the projectile travels through tissue. It has been long known in the medical industry that a trocar point penetrates the dermis layer more efficiently... the G2R RIP Round. 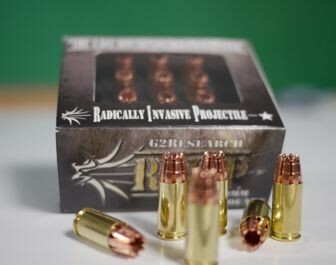 20rds a Box SKU: AG99 This item is restricted in the following cities and/or states: AK, HI, MA, NY, APO's, FPO's, PO Box's, Washington DC; California Cities: Los Angeles, Yolo City, San Francisco, Sacramento, Oakland and Beverly Hills. Illinois Cities: Chicago. FOID Required for all IL Cities. ; CT, NJ: Pistol Permit# Required. Please check your local State, County and City laws for restrictions on ammunition..